March 22-25 as the Minehead branch ‘Goes Great Western’. 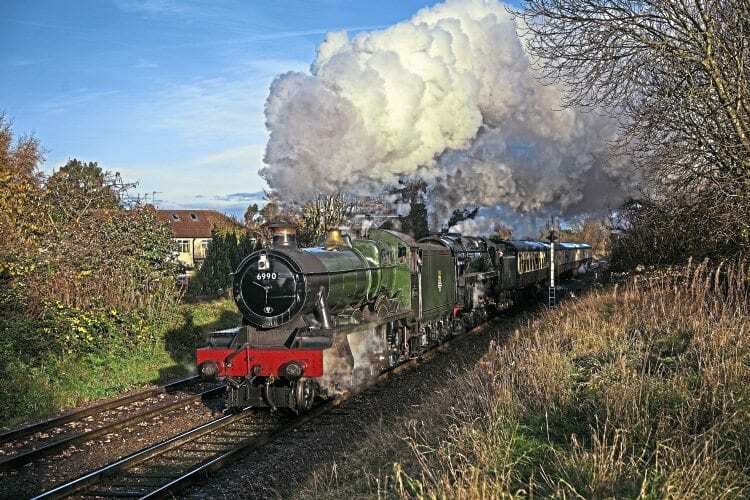 The Great Western Routes & Branches event will bring together a combination of visiting and resident Western motive power to celebrate the many facets of the GWR – and later BR(W) – operation. From main line expresses and the humble auto-train, to wartime foreign imports and local goods, the gala will provide a flavour of the Western at its finest. The uniting of two ‘Modified Halls’ comes courtesy of the Great Central Railway’s No. 6990 Witherslack Hall, which the Leicestershire line is releasing for the event. The BR-built Locomotive Exchanges veteran will join WSR resident classmate No. 6960 Raveningham Hall, which having been built in 1944 differs from its sister in carrying GWR livery rather than BR. No. 6960 is the only one of the six preserved ‘Modified Halls’ to pre-date Nationalisation.